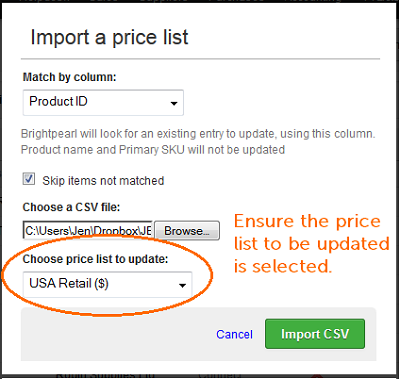 Brightpearl does not manage prices on ekmPowershop. The price selected against the sales channel is used only for creating customer record, essentially adding them to a default “customer group”. Prices will need to be updated on both systems, both of which provide importing routines for helping to manage price lists. Brightpearl also supports pricing tiers/breaks, or volume discounts. ekmPowershop offer a Bulk Discounts feature which can add this functionality to your store. Note : Prices must be net (excluding tax). No column headers should be used. Go to Settings > Products / Inventory > Price lists , and click the Import a price list button at the top of the screen. Select by which field to match products - product ID or SKU. Select the price list to be updated. Browse for the .csv file and click the Import CSV button.